Renting a room from a stranger can be a scary decision to make and it puts you in a very vulnerable position, one where you can be scammed and end up homeless. It’s a choice most of us would rather not make, however in today’s housing market and job economy, it’s almost a necessity by most residents in the San Francisco Bay Area. But the risk of scams is real, for instance one could offer you a room, collect your deposit and then run into problems with their landlord and them not being able to sublet or rent to you. By the time that’s all happened, good luck getting your money back. Here are some questions that you should ask before moving in with a new roommate. Do they have permission to rent a room or sublease to you? This one is really important. As a tenant, they signed an agreement with their landlord and they may or may not allow for them to rent a room out. You’re going to want to see a lease of theirs to be sure they are allowed to rent to you. In some cases they may have just hit financial hardship and need you in there for a month or two to keep them afloat and think they can get away with it in hopes that the landlord does not find out. But when they do, it could be a mess. For you. Ask to see their lease. If they are sketch about showing you their lease, chances are they are not allowed to rent to you or are going to be charging you a ridiculous amount of rent to cover their own half. Which may be illegal depending on the city(such as Berkeley). You’ll want to look that up for the city you’re renting in. Generally you should only pay half if you are allowed half the space. If you have an agreement that bars you from the living room or kitchen then you would pay even less. Bottom line is if they are a good person looking for an equal roommate in the long run, then they will happily show you their lease. Have they had roommates before? This is an important question, maybe they themselves don’t know how to act in a roommate situation or even know the local laws. You’re going to want to ask them how long they have been doing it, why did the last roommate move out and maybe even for “references”. They themselves are usually asking you for references, it’s a 2 way street. Maybe the last roommate will say they were crazy or never cleaned up or even worse, scammed them. If it is the first time they’ve ever rented out a room, be prepared to be the test subject and hope for the best. They may regret giving up thier private home soon after. Also, work up a roommate contract. Can they charge you for a credit check / background check / application fee? Maybe. But this is where a lot of scams do come into play. A landlord is allowed to collect up to $30 in California for a credit fee. However, to be sure they are not scamming you, you have the right for proof of receipt, that they actually used that money to do the check and for a free copy of the credit report when they run it. If you demand these things up front, chances of them moving forward, taking your $30 and not doing it are much smaller. But it is a scam, people offer rooms they do not have simply to bank on application fees. And that is how they pay their own rent. 5 applicants a day could be very profitable. No, they are not. All deposits must be refundable no matter what they call them. Some call it a security deposit, some call it last month rent and some even a cleaning deposit. But they must be refunded when you move out. There is no such thing as a $500 non refundable deposit. Make sure you’re compatible roommates! You really want to make sure you can live with this person. You thought going on a first date could be awkward? Well at least you can walk away from that. Imagine moving in with someone only to find out it was a nightmare of a choice. Some basic stuff like, will they allow you to cook meat in their kitchen or judge you for drinking. Are you allowed to bring guest over or are you banned to eternal loneliness in some stranger weirdos house. Are you allowed to be there when they are? A lot of people have this idea that they will get a roommate and they will always be gone and never cross paths. Some even say things like “must not work from home” or “no home bodies” because they need the extra income but don’t want to actually have a person in their home. I’d stay away from those who don’t even want you there in the first place because ultimately it can only end with them wishing you were not there no matter how cool of a person you are. A lot of Craigslist ads say “spacious” or “large” and you think you can fit all of your belongings in the room, but ultimately, they are usually pretty small rooms with small closest and minimal storage. They have likely filled all other closest in the home already leaving you with nowhere to store your personal belongings. So do be sure to ask about personal storage or be prepared to rent a storage space. This is important because going from your own living space to a roommate situation can leave you more crammed than you think. Choose your new roommates wisely! Starting with the Craigslist room for rent ad you can already tell a lot about someone. How thorough was the ad? Were there photos? Did they include basic information? Neighborhood amenities? etc. Some ads are so basic you can tell they are not very intelligent people. It has nothing to do with how computer literate they are. Anyone listing can type more information. Some don’t even include the rental price, location, room size, transportation options, etc. Someone listing an ad like this is highly likely to be a poor roommate choice. An ad can tell a lot about someone. Many people simply do not give this information so be sure to ask. A room renting for $700 could turn out to be $900. Who knows? Do they run the heater nonstop? Are they expecting you to help pay for their $150 cable TV package you want nothing to do with and would never purchase on your own? Do they have electric or gas heaters / ovens? Do they pay for water and garbage? Are they trying to get you to pay $50 for “wifi”(I hate when they don’t realize it’s internet and wifi is just a connection option) when the total is only $60 a month. All of these add up really fast so be sure to have this part set in stone from the get go. Splitting the utility bills can make or break a good priced room. Do not start off by signing a 1 year lease with some stranger from Craigslist that you know nothing about. If you can, go for a 6 month or even month to month lease. It would be such a shame to get stuck for a year with a terrible person. Don’t sign up for another site. I’ve found a ton of rooms that looks pretty good, lower than average but not too good to be true. Just good enough to get you to be interested. The problem is that once you email these people they send you a link to another site that is asking you to sign up or log in with your Facebook in order to view details on the rental. This is a scam. If they were really interested in obtaining you as a housemate they would have a full ad on Craigslist and not demand you go sign up for some other site. These sites either want to steal your information or are paying per sign up. Don’t do it. If you yourself are offering a room for rent, you also have to watch out for scammers. The biggest one would be Nigerians pretending to be international students looking to rent a room from you. What they do is send you fake money orders, above the amount you’re asking for and ask you to send the difference back to them in cash. Duh, this is obviously a fake scam but it works and that’s why they keep doing it. So just don’t even deal with them. 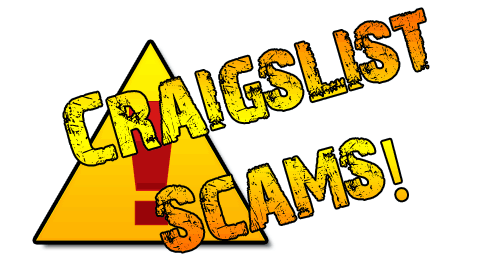 If you have a story about being scammed on Craigslist while renting a room or apartment, please comment below to make others aware and share this article.